The my year on Spotify feature they've released is such a brilliant idea! Although I've only been using it since September time I was pretty curious to see what I'd been listening to laid out nicely with colourful graphs. There's something about analysed statistics that I find oddly pleasing. 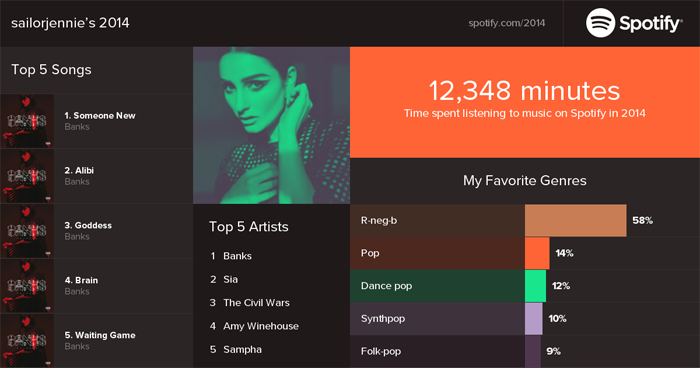 Banks got a lot of love from me, all of my top 5 songs coming from her fabulous album. Someone New is probably my favourite song of the year so I'm not surprised that it's sitting in the top spot. If I didn't own Sam Smith's album I'm convinced he would comfortably be at number 2 of my top 5 artists, but other than that I think it's pretty accurate! Who was your most listened to artist this year? P.S. I don't know whether you've been watching The Missing on BBC1 over the last 8 weeks but the final episode was aired on Tuesday night and I'm still so sad about it! You know when you really connect with a fictional character and things don't end up going their way and you feel really sad for them? That's me today for sure! I've been meaning to generate this, but every time I hear the ad I'm in the middle of a serious jam session! I love the look of statistics too, and yours are definitely very Banks oriented. This is such a cute feature! I keep meaning to look but I'm pretty sure that this year I've listened to so much of The National that everything else will just make up a pretty meaningless percentage of my musical habits! Also, I agree with you on The Missing! I've been walking around a little sadder since - I'm still reeling off a million theories a day about the whole thing ha. Such a good idea. I am not really one of those people who can just sit down and listen to music though! That's such a fun thing to look at! Very cool!